Photos contributed: Marion Miano, 86, a diabetes educator at Orleans Community Health, receives a Distinguished Alumni Award from Tonawanda High School. MEDINA – At 86, retirement isn’t in Marion Miano’s schedule. 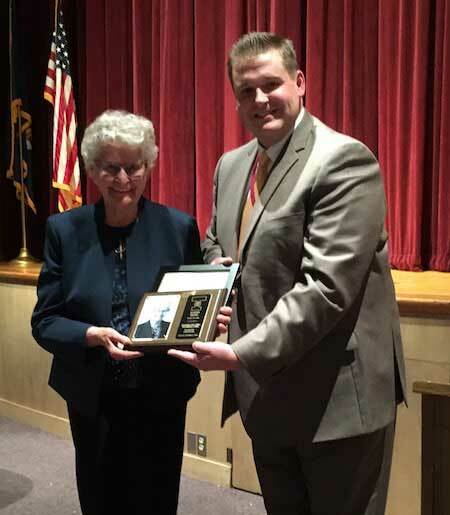 A certified diabetes educator, Miano graduated in 1950 from Tonawanda High School, where she was recently honored with the school’s Distinguished Alumni Award. The former Marion Charsley, Miano of Indian Falls furthered her education at E. J. Meyer Memorial Hospital’s School of Nursing, where she graduated in 1953, first in her class. Sixty-five years later, Miano remains active and dedicated to helping her patients. She continues to teach diabetes education every Wednesday at Medina Memorial Hospital, where Cindy Perry, director of education, wellness and marketing at Community Partners, calls Miano a remarkable woman. Miano began her career in advanced coronary care after attending an intensive six-week course. She assisted in setting up the first coronary care unit at the former St. Jerome Hospital in Batavia, where she was appointed head nurse of that unit. Her nursing career expanded beyond coronary care when she became the first certified diabetes educator at the Batavia VA Medical Center and Rochester Clinic, where she cared for veterans for 28 years who served from World War I to Operation Desert Storm. Her awards include the Administrator’s Award for Excellence in Nursing in 1984; Special Advancement and Performance Honors as the first Certified Diabetes Educator at the VA Medical Center in Batavia in 1991; Nurse of Distinction in 1993 at the VA Medical Center; Western New York Diabetes Educator of the Year in 2003; and Batavia/Genesee Zonta Club’s Woman of the Year in 2003. Miano often traveled to the homes of patients who needed diabetes education, but were homebound. She would take medical supplies and monitoring equipment with her. The result was a better understanding of diabetes, which had a positive impact on patients’ lives. These visits were often pro bono, because Miano was and is passionate about helping patients and her community. She not only provided outstanding care at the hospitals where she worked, but Miano has performed numerous other activities related to nursing. She was treasurer of the Western New York AADE for 10 years; co-chairman of the Diabetes Walk for more than 10 years; a Tour De Cure rest stop captain for 10 years; and group facilitator for the last 20 years at the Batavia VA Medical Center, Medina Memorial Hospital and Clarence community. She has done countless presentations for the Lions and Rotary clubs, senior citizen groups, teachers, nursing staff, health fairs and educational seminars. She serves Wyoming, Genesee, Orleans, Erie and Niagara counties. In addition to providing comprehensive diabetes education to inpatients, outpatients and groups, Miano also has a private practice. 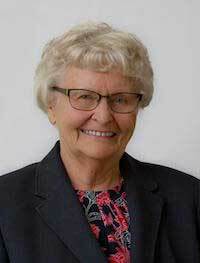 She is in her 65th year contributing to her profession, her patients and her community. She still facilitates support groups in Clarence and Medina. This extraordinary woman with boundless energy accomplished her career while she was a devoted wife to husband Peter and mother of five children, Mark, Margaret, Anthony, Alan and Joseph.